Set the boolean serialization format. Helper method which appropriately obeys the real format. 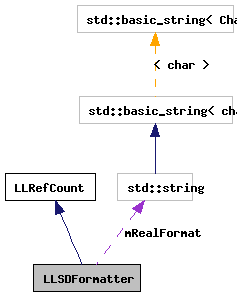 Abstract base class for formatting LLSD. Definition at line 279 of file llsdserialize.h. Definition at line 291 of file llsdserialize.h. Definition at line 935 of file llsdserialize.cpp. Definition at line 929 of file llsdserialize.cpp. alpha Serializes boolean as alpha if true. Definition at line 938 of file llsdserialize.cpp. Implemented in LLSDNotationFormatter, LLSDXMLFormatter, and LLSDBinaryFormatter. real The real value to format. Definition at line 948 of file llsdserialize.cpp. Referenced by LLSDNotationFormatter::format(), and LLSDXMLFormatter::format_impl(). format A format string which follows the printf format rules. Specify an empty string to return to default formatting. Definition at line 943 of file llsdserialize.cpp. Definition at line 342 of file llsdserialize.h. Referenced by boolalpha(), LLSDNotationFormatter::format(), and LLSDXMLFormatter::format_impl(). Definition at line 343 of file llsdserialize.h. Referenced by LLSDNotationFormatter::format(), LLSDXMLFormatter::format_impl(), formatReal(), and realFormat().